Love is the Higher Law showed another side of the events of 9/11 – what teens actually went through in NY, where they were when the planes hit the world trade centre and the events that followed. Before I Fall, Lauren Oliver. 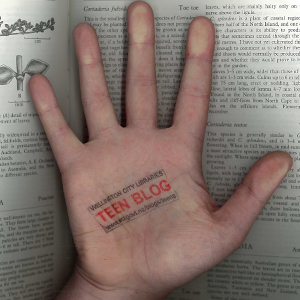 Lauren Oliver’s blog is here. She uses blogger.com (if you’re interested in blogging). Getting Revenge on Lauren Wood, Eileen Cook. This one gets the Lauren Award for the best book cover with the name Lauren in the title. TTYL, Lauren Myracle. TTFN and L8r, G8r too. Her blog is here. Fallen, Lauren Kate. There’s also Torment, and then Passion, which comes out in June (reserve it now! Become a Facebook fan). L A Candy, Lauren Conrad. The first in the series that also contains Sweet Little Lies and Sugar and Spice. Chestnut Hill series and the Heartland series, Lauren Brooke. For horse lovers. The Devil Wears Prada, Lauren Weisberger. We also have the DVD starring Anne Hathaway ($4 for one week). The rise and fall of a 10th-grade social climber, Lauren Mechling and Laura Moser. Lauren Mechling blogs using WordPress here. Lauren Conrad: style, Lauren Conrad with Elise Loehnen. Not fiction, fashion this time. Have a look at the Fashion Friday post inspired by The Hills. Lauren the puppy fairy, Daisy Meadows. Unlock the magic within at the official site. If you want to re-live your movie experience in music, but you’re not sure if you want to buy the CD then reserve the library copy of the Twilight Soundtrack and try before you buy for free (on a YA card, that is). There are some interesting artists on here, including Iron and Wine (we like Iron and Wine) and Muse and that, so it’s bound to be good. Or listen to it now! Legally! If you are interested in following the US Presidential Elections (which are being held tomorrow NZ time) here are a few links to check out. These sites will be updated regularly during tomorrow’s election, so that you can follow what is happening in one the most anticipated elections in recent times. It’s Senator Barack Obama versus Senator John McCain, both new candidates, and after 8 years of President George W. Bush, America is ready for a change. Send us your thoughts. Who do you think will be the next President of the United States of America? Will the history books be rewritten? Gale’s Biography Resource Centre entry for Barack Obama is here. (You’ll need your library card number.) John McCain is here. The World Book Student pages are here: Barack Obama; John McCain.